Update: The Steam listing was off (by a single day). It looks like Geralt's final adventure is coming on May 30. 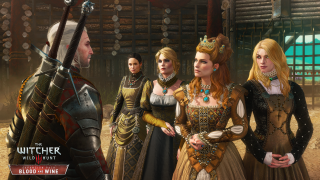 A Steam listing for The Witcher 3: Blood and Wine expansion that turned up over the weekend gave a release date for the DLC expansion that sends Geralt to an all-new region of the world full of monsters to kill and alcoholic beverages to enjoy responsibly. According to the since-unlisted-listing, the new region of Toussaint rivals "No Man's Land or Novigrad in size", and players can expect to spend at least 20 hours exploring its reaches and running down the murder mystery narrative. Geralt can even retire (in the temporary sense) to his own vineyard when The Witching gets to be too much for his old, toxic bones. Most importantly, it adds a new Gwent deck to the card-game-within-a-game. Hopefully the leak is accurate and you won't have to wait too much longer to start dealing out the forces of Skellige.